Does the need for oil drive U.S. foreign policy? The United States depends on foreign imports to satisfy more than half its voracious appetite for oil. Despite efforts to diversify oil suppliers and conserve energy after the 1973 Arab oil embargo, growing energy consumption all but forces the United States to continue relying on Middle Eastern oil. That reliance is likely to continue despite the threat of war with Iraq and growing anti-American sentiment in the region. The Bush administration proposes reducing America's dependence on foreign oil by intensifying domestic production in Alaska and other environmentally sensitive areas. 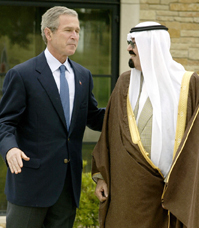 Critics contend that the thirst for oil is behind the administration's plan to invade Iraq as well as its willingness to repeat Cold War mistakes and maintain close relations with dictatotial regimes accused of human-rights abuses.